7 years of experience make the video brochures. Shenzhen Cheer Trend Development Ltd. is a leading company in China specialized in making video brochure / video greeting card, video module, sound module with our own R&D department and large-scale factory. We provide perfect and complete solutions for customers all around the world. All our products are selling well in both domestic and overseas markets. We have become one of the fastest developing companies in China with a bright future. We located in Shenzhen City, Guangdong Province, China. We have 200 staff members, including 30 engineers. 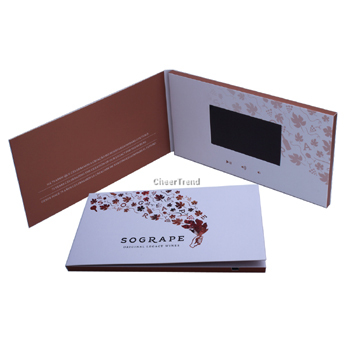 Our main products include video module, video brochure /video greeting card , sound module and music greeting card. 1. We invest large amounts in the R&D department every year. We have established good and cooperative relationships with several famous companies. 2. All our electronic components are introduced from Top Band suppliers with good quality. 3. We have a strong and professional team, which consists of young, dynamic and skillful staff members. Over 40% of our employees are technicians. 5. We control the quality by implementing 7S and ISO9001 management systems. All of our products comply with CE& RoHS standards. 6. We perform strict quality control, careful and endurable packing and punctual delivery. 7. Besides giving our customers the best quality products, we are offering our outstanding customer services to our existing and potential clients. 8. We have rich experience in making the voice promotional items, such as sound modules, music greeting cards, voice key chains, recordable photo frames, music boxes, voice gift bags, recordable post cards, music books, ICs, etc.